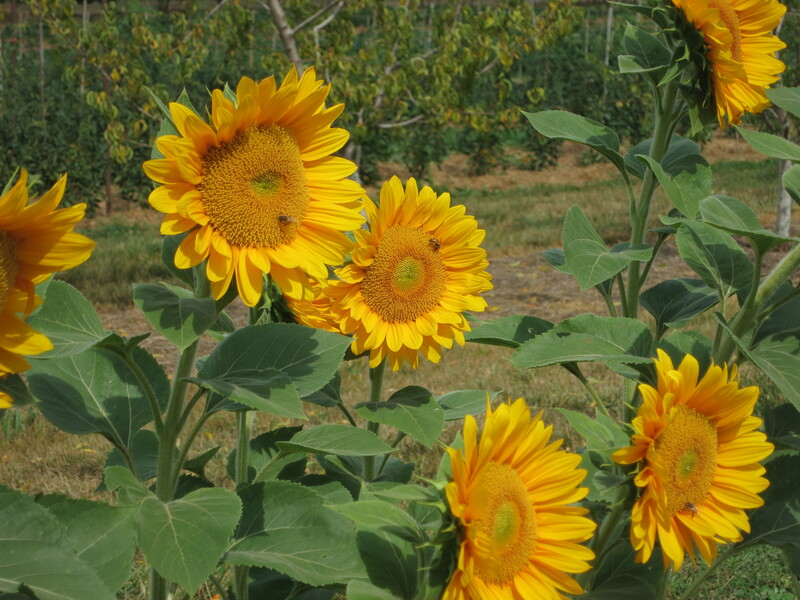 Sunflowers just seem to make people happy! And we’ve got a long row of them, which is a whole lot of happiness. They are at their peak right now & looking bright & beautiful. We took about 9 big pails full to market on Saturday – they were to first things to sell & we sold out in a hurry. We had some for sale at CSA pick-up on Friday & lots were snapped up. There’s even some available at the road – self-serve – and they’re moving there too. It seems that people really like sunflowers. 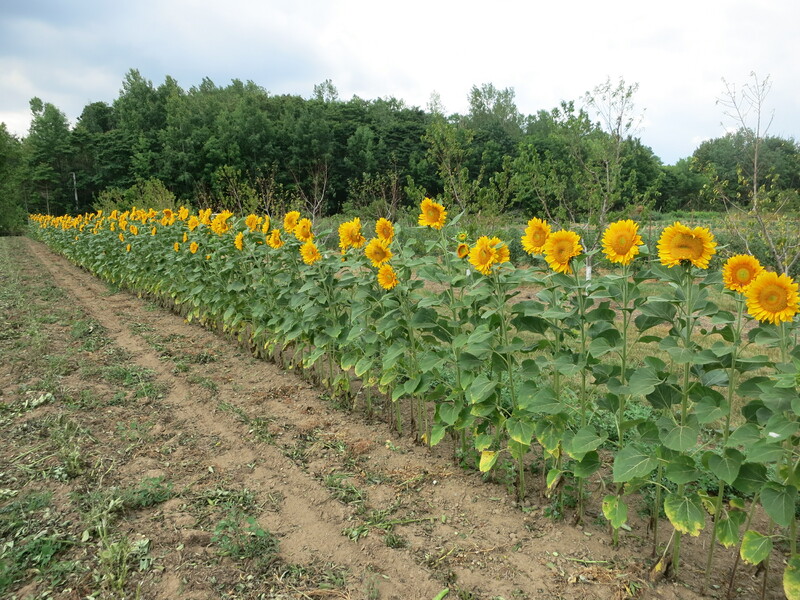 The plan was to plant a lot of sunflowers this season. We ordered a whole pile of seeds in the winter – 5 or 6 kinds, different colours & sizes. 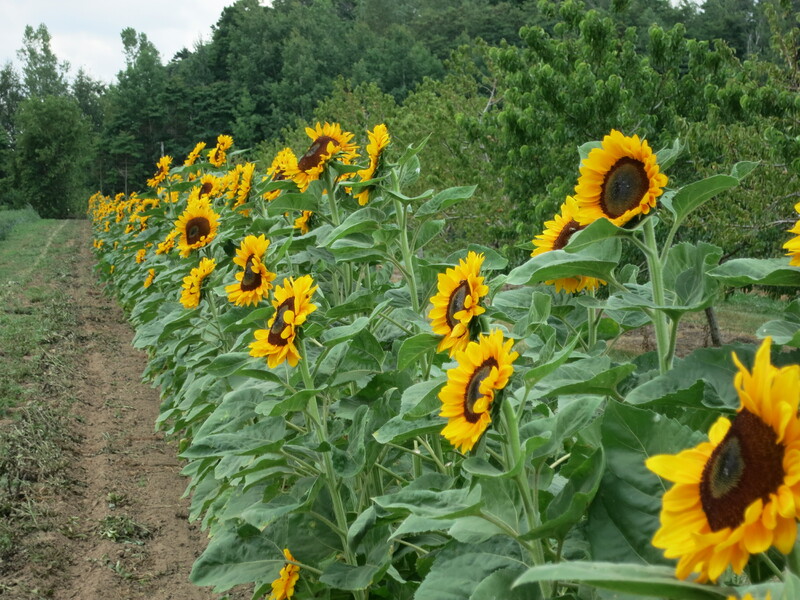 We would seed a row every week to ensure a continuous supply of blooms for much of the summer. Even if sales were poor, the farm would look great! The reality was that we seeded that first row – and no more. We got busy … it got dry … so only 1 row. They’re blooming now and by next week they’ll be over. But for now, that row looks great! 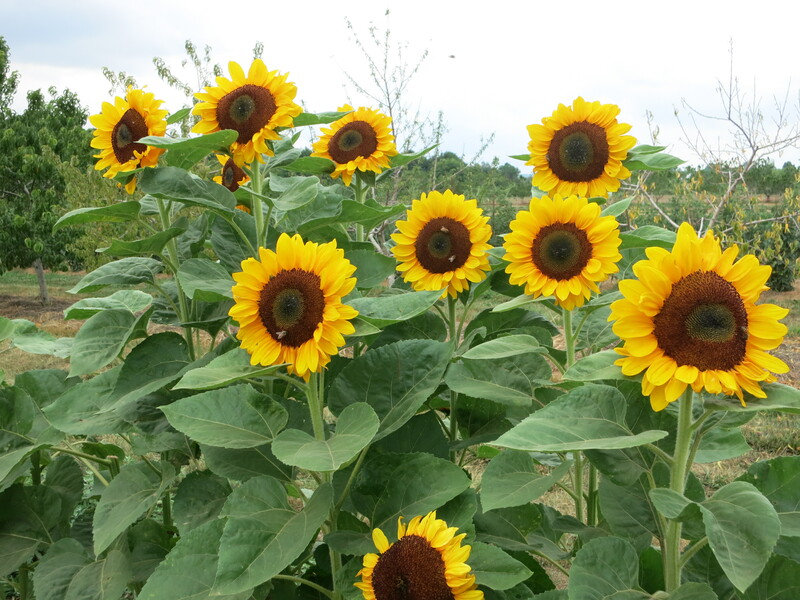 And sunflowers are making us happy! Tomatoes, basil, broccoli, zucchini, green onions & beets. With each pick we are harvesting more & more tomatoes. Along with the early cherry & grape tomatoes, we are now picking salad size & even a few large tomatoes. I know that in a few weeks everyone will be groaning at yet more tomatoes, but at this stage in the season it’s a big hurray!! What goes with tomatoes? Basil! There will be a bunch of fresh basil in your share this week – the beginning of a beautiful tomato-basil salad. While the first planting of broccoli was sparse, the 2nd … & 3rd are maturing together & coming on strong. The heads are not large because of the dry conditions but they taste great. Find several in your box this week. We put another planting of zucchini in the ground last week, but the first patch continues to produce well. 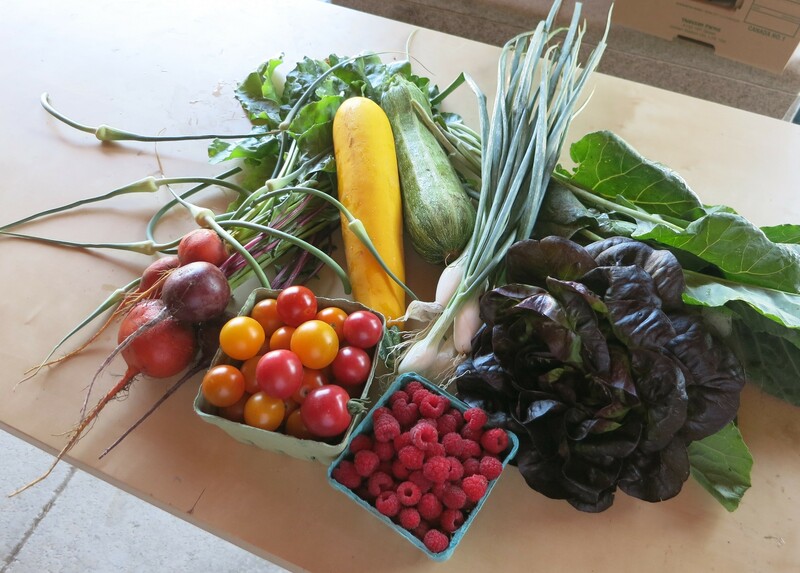 Choose from green, yellow or green striped, & maybe a few patty pan summer squash. Different shapes & colours but all taste similar & are used the same way. This is probably the end of the green onions. Next week should see big onions in the share. Beets – we’ll call them baby beets since they don’t seem to be growing at all. Enjoy another bunch this week.